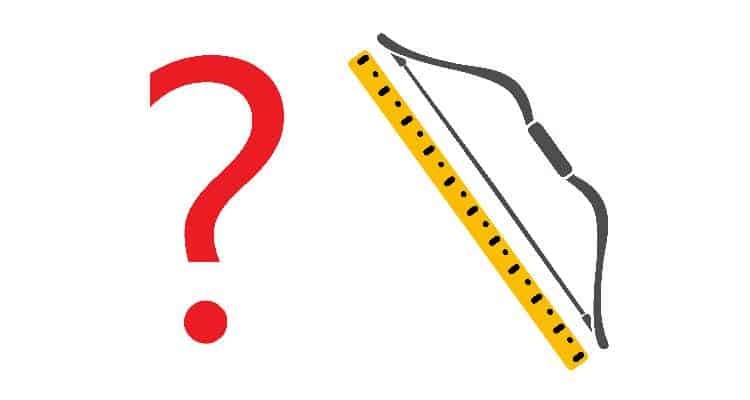 If you’ve looked in online or visited specialised shops and looked at recurve bows you’ll have noticed that complete bow sizes are measured in inches from 48” all the way up to 72”. Although recurve bows are forgiving and will allow you to shoot with a draw﻿﻿ length that is either too short or too long in order to really get the best from a bow you need to be drawing to it’s sweet spot. The sweet spot is the point where the advertised draw weight will be the actual drawn weight, drawing past this point will result in a rapid increase in draw weight known as ‘stacking’ which may make you inaccurate as you’d be pulling more weight than expected, and drawing your bow too short will result in an underpowered shot. In the tables below you’ll see bow sizes measured in inches, and this inch measurement refers to the AMO (Archery Manufacturers Organization) size of the bow which you’ll see listed in bow specifications online and on this site. There are 2 methods for finding your bow size. As a simple rule of thumb bow length should be at least double your draw length, but this doesn’t always correlate to a good decision, so the values in this table should assist. You can just go with the basic premise that all people proportioned relatively similarly and using the table below, lookup your height bracket and this will give you a corresponding ideal bow size. I hope this has been helpful and you’ve found what you were looking for and you now know your ideal bow size, but as always if you have any questions please leave a comment below or send us a message! So what do I do… I’m 4 feet and 9 inches?